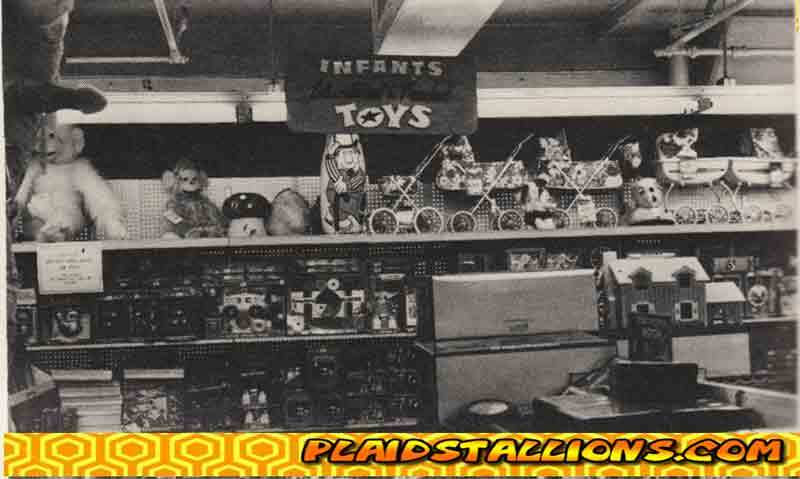 Easily my favourite job when working on this site is finding vintage toy store pictures to share. 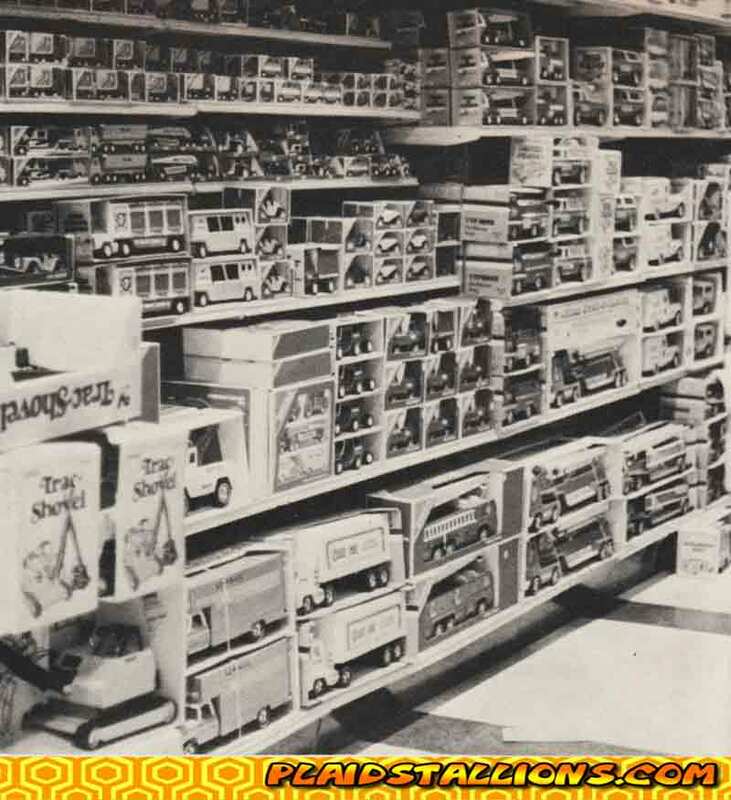 Nothing beats a whole aisle of what you collect. If you're digging this then please check out Part One, Part Two and Part 3 and Part 4 in this series. I hope to bring Part 6 in the next few months, wish me luck! Nothing beats an aisle full of adventure Team G.I. Joe, unless it's joined by a minty display box of Mego World's Greatest Superheroes. 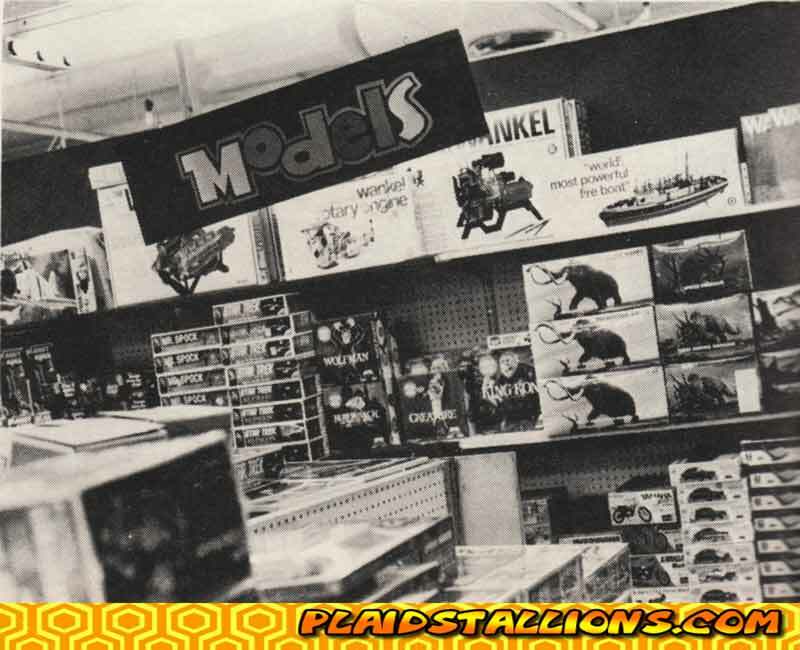 Another great shot from the same store but now the Hobby departmen, look at those great Aurora Glow in the Dark Monster kits, prehistoric scenes and what seems like an excess inventory of AMT Mr. Spock Kits. An amazing assortment of board games in 1976, the pre video game era. If you look closely you'll see a pile of Marx "Tin Can Alley" sets above.. 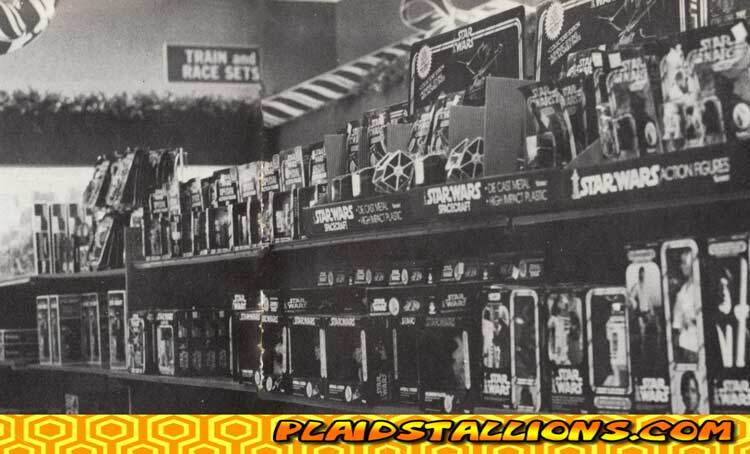 This incredible picture of a Rich's Department store in 1980 shows off some beautiful Kenner Star Wars pieces including rare 3 packs, diecast and 12' figures. Think they have enough Jawa figures?. A whole wall of Tonka Trucks from 1976. 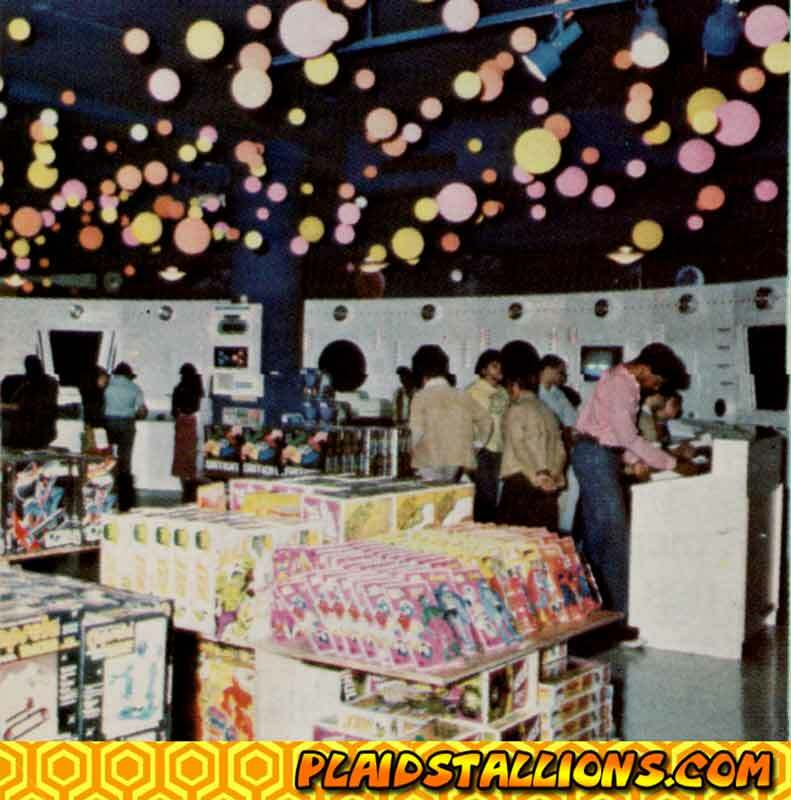 From Gimbels department store in 1980, we have a whole table of Mego World's Greatest Superheroes in full glorious colour! 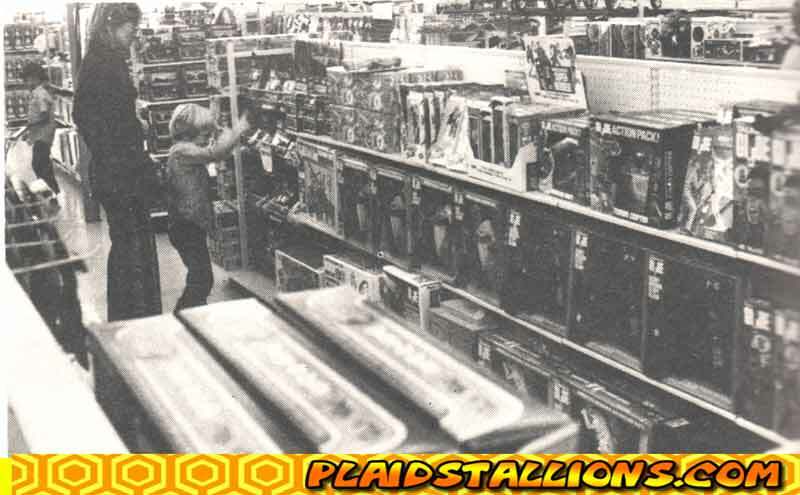 Note the 12" Mego Hulks and Remco Spider-Man Helicopters in the background.. 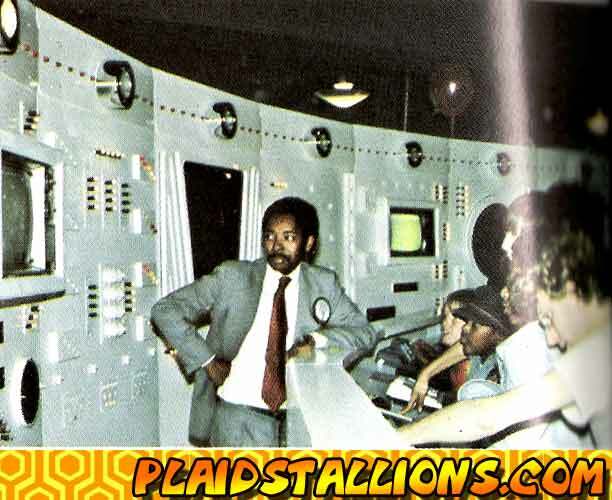 The video game test area of the same Gimbels is made to look like a space ship, doesn't the salesman look thrilled letting kids play with the then top of the line Atari 2600? 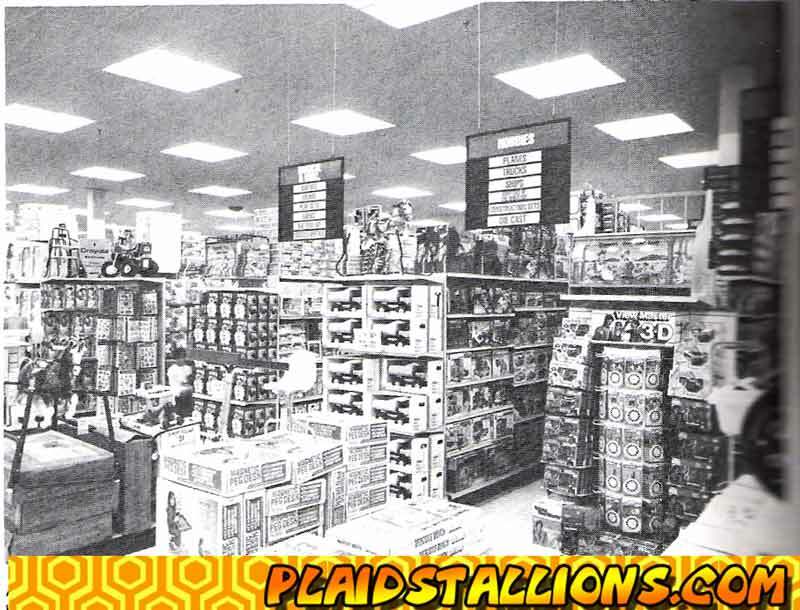 Gimbels had cameos of popular characters but why the hell would a toy store have Punchy the Hawaiian Punch guy? For more store appearances check out our Superhero store appaearance section. 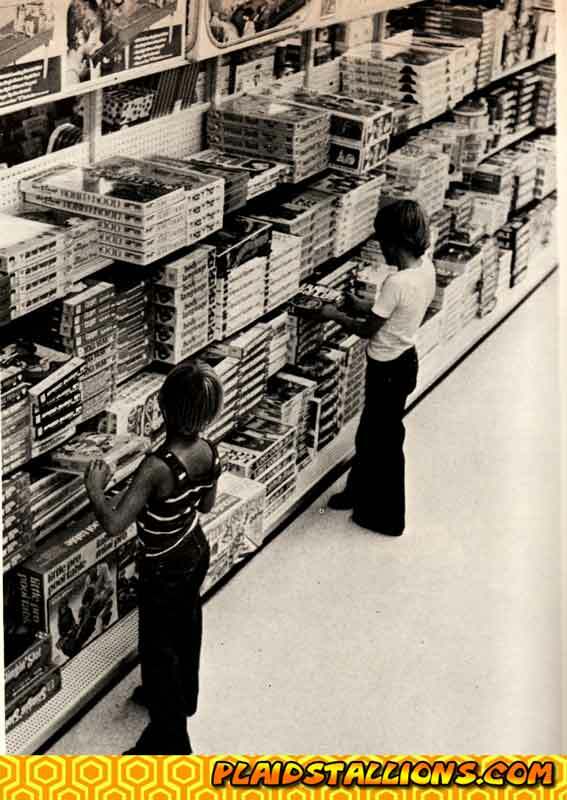 This is K&K Toys in Virginia Beach, Virginia in 1977. 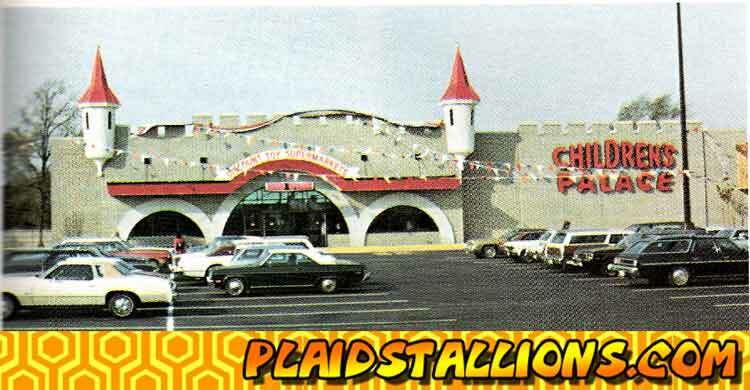 K&K at the time had 20 locations, their interiors were painted Ontario Violet and Matador Red according to articles. I just wish I could see the display in the front better. 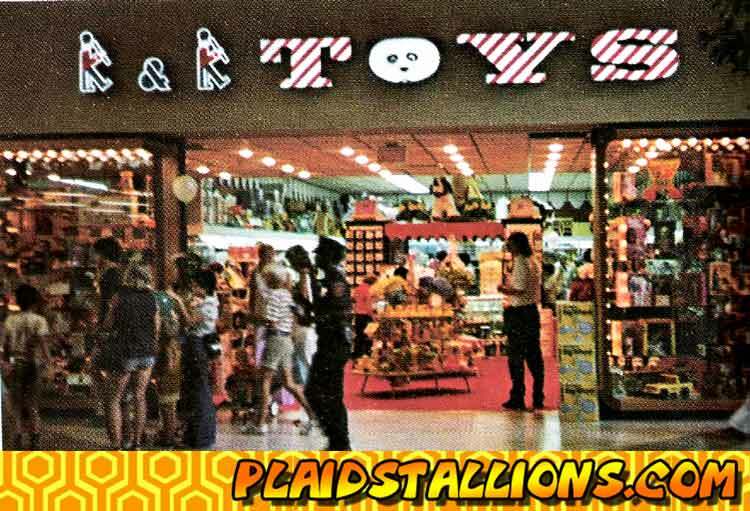 SE Nichols in Hagerstown, MD around 1985, this was a "toy department of the future", look at that giant viewmaster display. 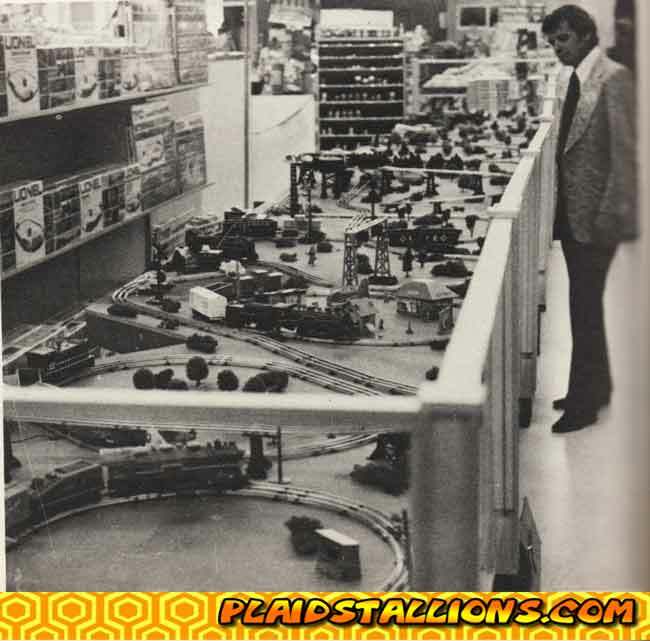 A unknown pre school aisle from 1976. 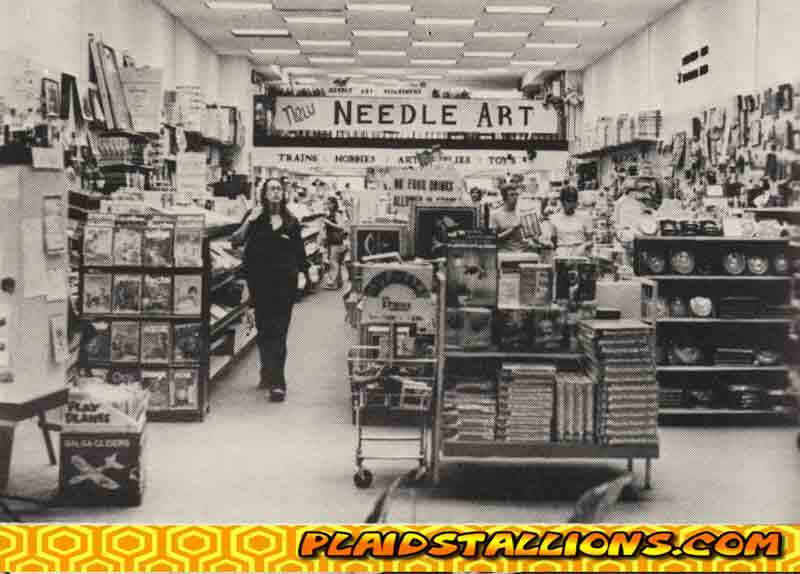 This is an unknown hobby store also from 1976. 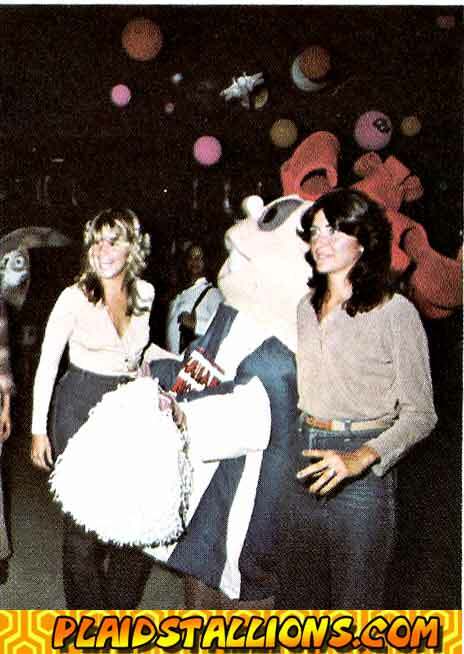 I had one of those gliders pictured at the bottom right. 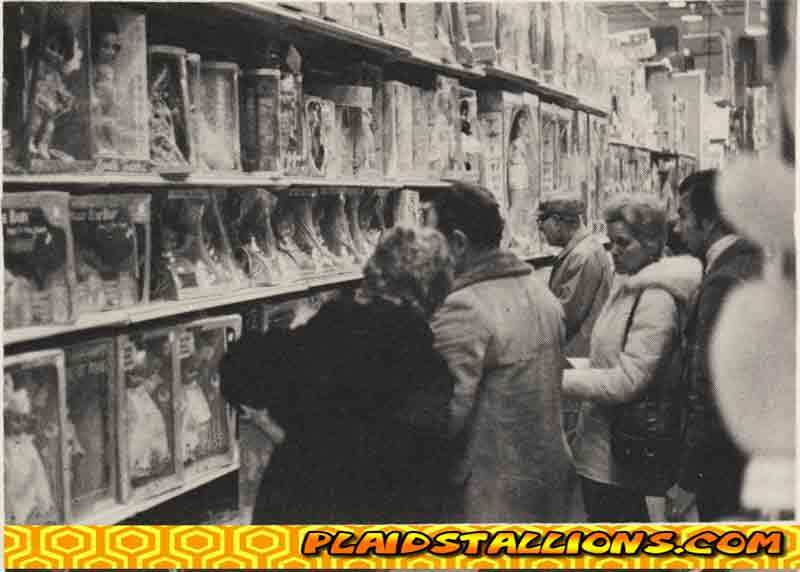 An unknown doll department from 1976.